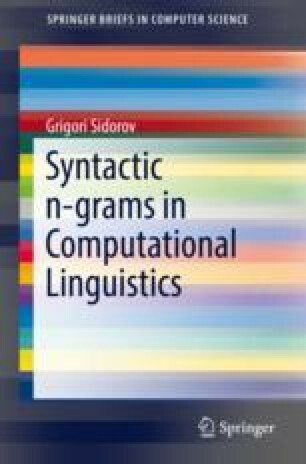 So, we have already learned how to obtain syntactic n-grams (although, at the moment, we are considering only continuous syntactic n-grams). Now let’s discuss what types of syntactic n-grams exist depending on the elements they are formed of, i.e., what kind of elements (components) can be parts of syntactic n-grams. In fact, the considerations to be discussed are the same for any type of n-grams.